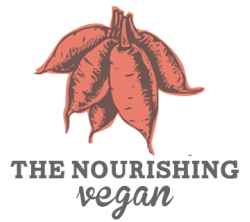 Welcome to The Nourishing Vegan Community! You are going to LOVE your FREE download of 5 Ingredient Vegan. Plus, I’ve also included a shopping list to help you save even more time and eat better than ever. Click the file link below to download! each made with only 5 simple ingredients. both time & money saving. Surprise, surprise... I’ve got one more JUICY GIFT for you. I’m guessing that you actually know some of the things that you could be doing to prioritize your health, but you don’t always DO them, correct? I could tell you every mistake and every secret I know about maintaining the ideal vegan lifestyle, things that have cost me hundreds of dollars and many years to learn... the truth is, they won’t do you any good unless you use them! And the only way to learn how to use these secrets the RIGHT way is to have support and accountability from someone who’s been where you are and gotten consistent results. That’s why as an exciting extra bonus I’d like to offer you a very special opportunity to schedule a 30-Minute Nourishing Vegan Strategy Session for FREE! Here’s the deal. I can’t do this for everyone. There just aren't enough hours in the day... so, you’ve got 48 hours to book your session at this special rate before I give your spot to someone else. If you’re sick dieting, having low energy or feeling like you’re doing everything right but nothing is working then I invite you to contact me for your free private 1-1 Nourishing Vegan Strategy Session today! CLICK HERE to book your session. My clients marvel at how much insight they get in just 30 minutes! Wouldn’t it be nice to stop feeling disappointed with your mediocre health and get the vegan glow? You’ll find these solutions are easy to implement and give you the kind of confidence and energy that wants to shine from the inside out! Schedule your session now. Just CLICK THIS LINK . This offer only lasts for 48 hours, so book yours now! p.s. For more recipes visit my blog, Sweet Potato Soul. There you'll also find my cooking show.